The premise worked. Four versus one. Five friends playing one vicious game of hide and seek, except this time the person hiding wants to destroy the planet. Evolve nailed it. After every battle the voice chat would be filled with stories. The team would be going on and on about the mistakes they made or the last minutes saves that happened. Then, the monster shows up. It is either lauded with yelling or shamed with laughter as it catches up on what all was happening hidden from its view during the game. That was fun, let’s do it again. Getting five adults together at the same time for a gaming session requires the entire universe to align just right, but Evolve rewarded us the few times that could happen. It’s ironic, too, because Evolve isn’t at its best when things go well. 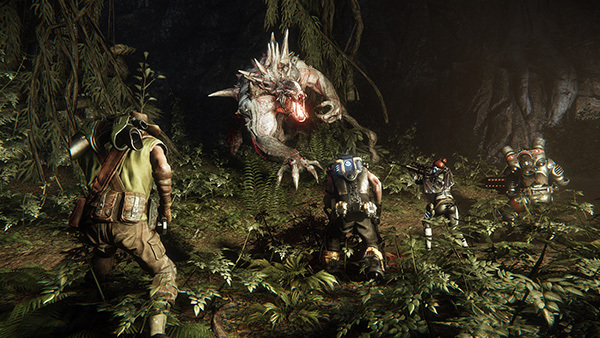 Evolve stands out when everything goes wrong, when chaos happens and friendships are tested. As I sat trapped in a human-sized plant, watching my life slowly drain away and my friends cluelessly running farther and farther away, I thought about rage quitting. In that moment, I had flashbacks to my elementary school playground and the good times when my friends wouldn’t casually let me die on the battlefield. Maybe things were better then? Probably not, because even my imagination didn’t make monsters as cool as Evolve. I could customize them for free, though, so maybe it is a toss-up. I kid, Evolve, thanks for making me realize who my true friends are.